The spring issue of Nutrition Frontiers showcases the association of gut microbial communities in premenopausal women, how high-fat, high-calorie-diet-induced obesity may increase pancreatic cancer, and the effects of calorie restriction protocols on pro-inflammatory cytokines. Meet our spotlight investigator, Dr. Purnima Kumar, and her research on black raspberries ameliorating the effects of smoking on the oral microbiome. Learn about ginger, the pungent root, upcoming announcements and more. 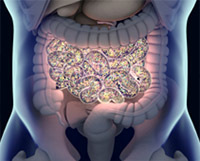 Gut microbial communities (GMC) may influence chronic microinflammation in obese individuals and increase cancer risk, yet the mechanisms remain uncertain. Lipopolysaccharides (LPS), a component of the cell wall from Gram-negative bacteria and an underlying factor of low-grade inflammation, is associated with high-fat diets and obesity. Citronberg et. al. evaluated whether GMC varied by concentrations of LPS-binding protein (LBP), a marker of LPS exposure, in premenopausal women. Microbial diversity and composition varied across tertiles of LBP. The most prevalent bacteria in the high and low LBP tertiles were genus Bacteroides and class Clostridia, respectively. Genes involved in gram-negative bacterial cell wall synthesis and dietary fat intake were associated with higher concentrations of LBP and inflammation (CRP). These findings indicate that GMC vary in relation to plasma LBP concentrations and that the inflammation associated with GMC may be driven by the presence of certain LPS-producing bacteria. Further studies should validate which dietary patterns lead to shifts in GMC that impact obesity and inflammation. Epidemiologic evidence links obesity to an increased risk of pancreatic cancer. To further understand the mechanisms of this association, Chang and colleagues used a mouse model mimicking diet-induced obesity and pancreatic cancer, by feeding a high fat high calorie diet (HFCD) to P48+/Cre;LSL-KRASG12D (KC) mice carrying a pancreas-specific oncogenic Kras mutation. Compared with animals fed a control diet, mice fed the HFCD had a higher weight gain and higher levels of insulin, leptin, and glucose in plasma, and showed more extensive inflammation and fibrosis. Most importantly, the occurrence of pancreatic cancer was remarkably accelerated by diet-induced obesity, especially among male KC mice. Additionally, exome sequencing of isolated murine PanIN lesions identified numerous genetic variants unique to diet-induced obesity. This study shows that diet-induced obesity can promote the development of invasive pancreatic cancer in KC mice, providing a valuable model to further investigate the underlying molecular signals and to evaluate interventions targeting obesity-associated pancreatic cancer development. The mechanism for the protective effect of calorie restriction (CR) on cancer prevention is unclear. Dogan et al. examined the short- and long-term effects of two different calorie restriction protocols, Intermittent CR (ICR) and Chronic CR (CCR), on serum concentrations of pro-inflammatory cytokines in female C57BL6 mice. From 10 weeks of age, mice were maintained on either ad libitum (AL) fed, ICR (50% restriction diet) or CCR (75% restriction diet) protocols for up to 74 weeks of age. Over 64 weeks, both CR, especially ICR, reduced serum IL-6 and TNF-α pro-inflammatory cytokine levels. Both types of CR protocols reduced serum leptin and IGF-1 levels while increasing insulin levels. Body weight was positively correlated with all parameters and there was a positive correlation between IL-6 and TNF-α levels. The beneficial effects of ICR may function through pro-inflammatory cytokine pathways. Further studies with transgenic mice models should clarify the roles of ICR mediated pro-inflammatory cytokines in the prevention of cancer. 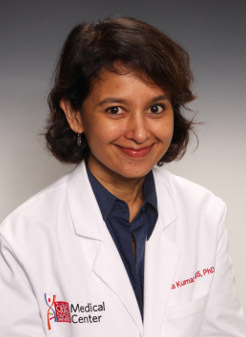 Purnima Kumar, BDS, MS, PhD is a Professor of Periodontology at the Ohio State University, where she completed her PhD in oral biology. As a periodontist and a medical ecologist, she examines microbial ecology of different habitats within the oral cavity. Her studies using OMICS research have provided a glimpse of the diverse and distinct flora associated with different habitats. She has discovered that bacteria colonize this environment long before teeth erupt, and that almost all of the early colonizers persist and form the basis of the adult dentition. She is currently investigating the effects of black raspberries on ameliorating the effects of smoking on the oral microbiome, as well as the effects of E-cigarettes on this ecosystem. Purnima was awarded a U01, Interactive Omics: Black Raspberry Metabolites and the Oral Microbiome in Smokers. Ginger, an aromatic rhizome, is native to the Himalayan foothills in Northern India and is part of the Zingiberaceae family, which houses other prized spices like turmeric and cardamom. This ancient root contains the phenolic compounds, gingerols and shogaols, and essential oils like zingerone, farnesene, ß-phelladrene, cineol, and citral which contribute to ginger’s pungent aroma and flavor. For centuries, fresh or dried ginger has been used as an herbal medicine to alleviate nausea and vomiting, flatulence, constipation and other gastrointestinal disorders. Nowadays ginger is being studied for its antiemetic effects during pregnancy and chemotherapy. Adding fresh ginger root can spice up your curry dish or stir fry - but don’t overcook it or you lose some of the essential oils. For homemade ginger tea, add freshly grated or minced ginger or 1-2 ½ inch slices of fresh ginger root in a large cup of hot water and let steep for 3-5 minutes. Flavor to taste with honey for a tea that will soothe your stomach and offer some zest!